Established in 1966, Gmmco is a part of USD 1.6 billion diversified CK Birla Group. The company’s core competency is in sales and support of Construction and Mining machines, captive power solution and the engines for various applications. 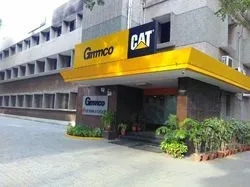 With over 5 decades of experience in the field and 3 decades of association with Caterpillar, the world leader in machines and engines, Gmmco is well placed to take full advantage of the construction and infrastructural boom that India is experiencing today, and become the market leader. The company has one of the largest networks of over 100 branches close to the customers, providing pre-sales and post-sales services. Services and Trading of Backhoe and Wheel Ladder. We have hired a team of highly talented professionals; these professionals are working with full dedication and support to achieve the set organizational objectives. We believe that our teams of experienced and skilled professionals are playing a vital role in our growing reputation in the market. To polish and enhance their skills, we are providing them regular trainings and seminars. We are among the prominent manufacturer and supplier of a quality approved range of Backhoe and Wheel Ladder. We are offering all our products in various specifications to choose from. Apart from this, offered products are quality approved against the set quality values by our highly experienced quality auditors. We are a best resource for the offered steel products. As a quality-conscious entity, we aim quality as the prime concern for us. For this, we have a qualified team of domain experts, which inspect that all the offered products are in compliance with the industry defined norms and standards. Also they ensure that defect free products are delivered to the customers.